This gallery can help you decide what you do or don’t like when choosing an engagement ring or other types of diamond jewelry. 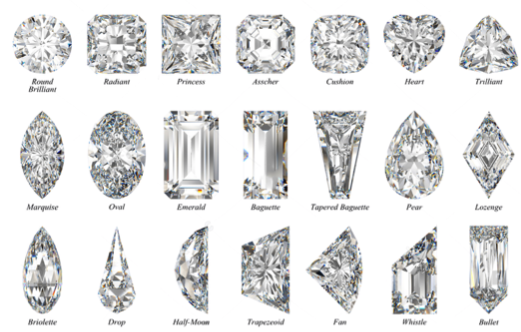 The most common center stones stones for engagement rings are the round brilliant, radiant, princess, cushion, oval and emerald cut diamonds, but any style can be put into a mounting. Cuts such as the emerald, baguette, lozenge and bullet give a more subdued sparkle while cuts such as the round brilliant, oval, and radiant are cut to maximize their sparkle payoff. Half moon, marquise, baguette, and trilliant are excellent accents when used as side stones. Tick Tock Jewelers has most of these diamonds that you can see in person, both loose and in a mounting. We can create anything your heart desires, and love to work with customers on designing their own rings and other types of jewelry. Posted on March 26, 2019 by Nicholas Gentile.